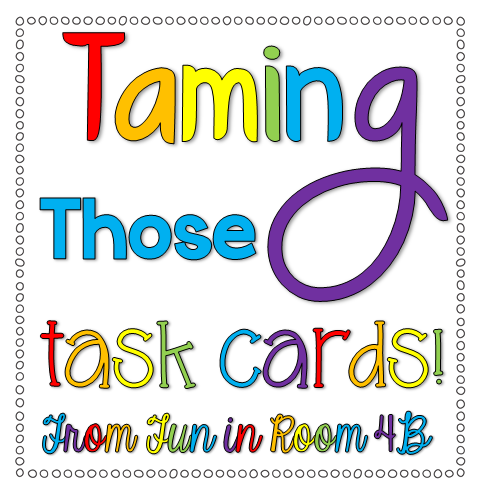 My tip for you is about taming the beast of task cards! I love task cards and have been on the search for a way to keep them neat and organized in my room. I switch out my task cards about every other week and I wanted a system that would allow me to do it quickly and still keep them neat and tidy. I found these index card holders during a "Back to School" sale last year and knew they would be the perfect size for holding the task cards that I had been using in my room. To make the boxes interchangeable, I adhere the label (that of course has been laminated) with a Velcro dot. I should buy stock in those little dots. When it is time to change the contents of the box, I simply remove the label and put it and the task cards back into the plastic bag and put them away! Then, I adhere the new label right on the same box. Fast and easy! These boxes are prefect for several different sizes of task cards, too. When not in use, I keep all of my task cards in plastic baggies (the mess above), but then put the baggies in the corresponding magazine box that organized and labeled by skill. Next up on the blog hop, you can check out how to use music in the classroom over at The Lesson Guide by clicking Lisa's button below. This is one of my favorite topics and I can't wait to read her post! You can also click on the links below. What are you waiting for? Have a great time hopping along! This is fabulous, fabulous, FABULOUS! Although I am not surprised because you are such an organized teacher. Even the labels on the boxes are perfect. I love this idea... and I hope you don't mind if I borrow it. In the meantime, I will investigate stock prices for Velcro dots... maybe we can be co-investors! Those are the magazine boxes from Ikea! They are super cheap, too! What a great idea! I love that you only bought one and use it for all of them with Velcro! Great idea! I wouldn't have thought of that and would have bought 20+ of them! Lol! Love all of these ideas-- the velcro dots are genius :) Thanks so much for sharing! Love how you are organizing your task cards! Changing the labels with velcro is a brilliant idea! Thanks for sharing this fantastic idea! I loved this post Elizabeth (and I'm not surprised in the least!). How awesome that you can change this piece of storage all year long!!! I've long admired your magazine boxes (now that would sound creepy and strange on anything but a teaching blog, wouldn't it?) they look so uniform and organized...I really should try these! Thanks so much for sharing this...your pics are gorgeous! This is brilliant! 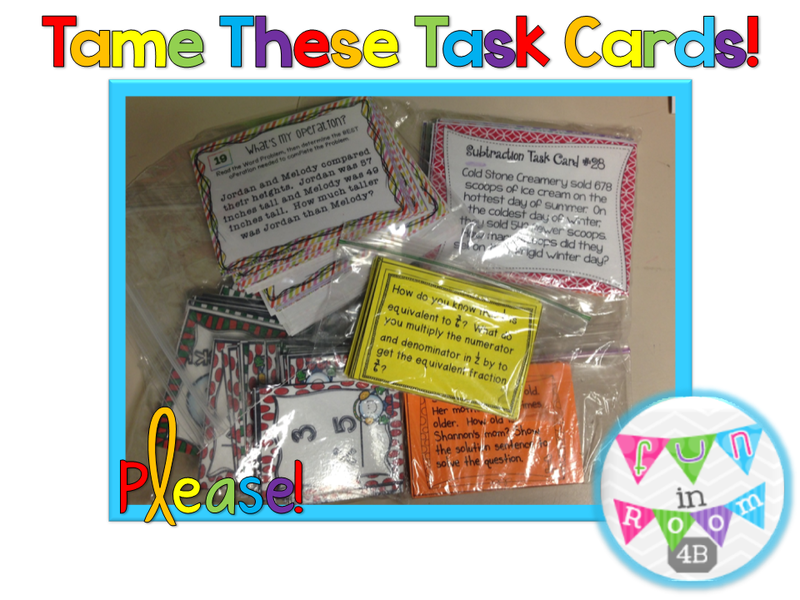 I've collected more than a few sets of task cards, and this is a cute, fun way for the kids to use them! I love how you store your task cards! This is something I am struggling with too! Where do you store the recording sheet that usually goes with the task cards though? I love your idea to keep the task cards in a plastic box while your kids are using them to make sure they all stay together! I actually don't use the recording sheets. My kids do the work on dry erase boards (copy limits). However, if I did, I'd either fold them and put them inside, or I'd store them in a pocket folder on the shelf with the boxes of task cards. I store my task cards in similar little containers as well, but I LOVE the velcro label idea!!! I've been stocking up on the mini accordian files, but now I will be stocking up on velcro and those magazine boxes instead- thanks for the ideas! Hopped on over because I need all the organization tips I can get - thanks!! I love this idea! I can't wait to use it in my classroom! I am such a stickler for organization. I love new organization ideas! I baggies everywhere! Love it!